Like most of my film entries, this post contains spoilers. 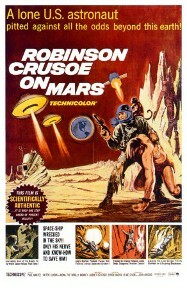 “Robinson Crusoe on Mars” is a science fiction adaptation of the Daniel Defoe classic. 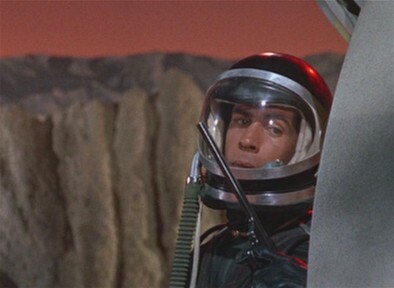 Set sometime in the future, it’s a surprisingly modern and compelling imagining of space travel between the Earth and Mars. The Criterion Collection DVD of this film was released in September; the previous laserdisc and VHS versions are long out of print. If the title and the subject didn’t already seem campy enough, the opening scene features Adam West and a trained monkey. Despite initial appearances, though, the film and set are quite understated. West plays Colonel Dan “Mac” McReady, the captain of a two man ship also occupied by Commander Christopher “Kit” Draper, played by Paul Mantee. Mantee is probably best known for his recurring role on “Cagney and Lacey” or his dozens of guest starring roles between the 1960s and 1990s. Mona, the monkey in a monkey-sized space suit, is their test subject, but Draper has become fond enough of her that he’s decided to take her back to Earth with them instead of leaving her behind on Mars as planned. The effects in “Crusoe” are quite good for the time. The minimalist interiors of the spaceship are extremely well-done, and avoid the temptation to crowd buttons and flashing lights into the scene to make everything look more “sciencey”. The grey paint on the ship even has a few wear spots and chips, making the ship look used. The exteriors of the ship and the pods look like American space exploration vehicles of the day. When the ship avoids being hit by a meteor, Mac and Kit are forced to eject in separate escape pods. Kit’s lands roughly but he survives. After discovering the air isn’t fit to breathe for more than a few seconds, Kit sees Mac’s pod land some distance away, so he makes the trek across the harsh landscape, stopping only to set up shelter in a cave. He continues to Mac’s pod, only to discover Mac didn’t survive. Kit buries Mac under a mound of stones. Up to this point the film borrows heavily from Western films, with the stark, barren terrain, lost partner, and Kit even drawing a hand gun when he senses danger. It should be noted that the cinematography by Winton C. Hoch is incredible, especially the scenes filmed in Death Valley at Zabriskie Point. Hoch was the cinematographer for many Westerns such as “The Searchers” and “She Wore a Yellow Ribbon”, and his experience in that genre is used to great effect here. Kit takes Mona, who has survived, with him back to the cave. He is forced to ration the food and oxygen but eventually discovers the yellow rocks he’s been burning have small stores of oxygen within them, and he’s able to release enough oxygen to survive by burning the stones. He fills his tanks with some oxygen so he can explore the planet; meanwhile he sets up his cave as a living space with a makeshift chalkboard, alarm clock, and furniture. He puts a plaque and American flag up on the “front door” to make the place homier. The radar he scavenged from the wreckage suddenly alerts him to the presence of a ship. The ship he and Mac had ejected from is still circling the planet, unmanned. Kit attempts to control the ship via voice-activated commands, but the ship has no fuel, so it can’t be manipulated. As his water is running out, he views some survival videos that come with the remaining equipment, but the now-humorous instructional video — hosted by the world’s biggest nerd — is of no help. When Kit realizes Mona never seems to need water, he tricks her into showing him where she goes during the day. He finds several pools of potable water and some edible reeds floating within. With his water, food, and oxygen needs filled, he decides to start exploring the planet. The sense of cheerful adventure is short-lived, however, as a stew made of the edible reeds makes Kit so sick he hallucinates that Mac has returned, but joy soon turns to terror when he realizes Mac won’t speak to him. Later he discovers a grave on the Mars surface. The deceased is someone who met a violent end and Kit, cautious and worried, takes down all the outward signs of his existence in the cave and sets the ship to self-destruct to hopefully avoid catching the attention of the probably hostile residents. When his equipment senses another ship approaching, he sees small alien ships zap at the rock and quickly zip away. Kit decides to follow them one night and surreptitiously films them. 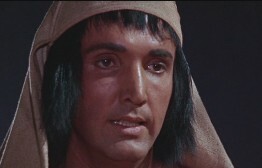 While doing so a person dressed like an Egyptian slave in a Cecil B. DeMille movie surprises him. You can tell the guy is going to be important, because he’s the recipient of what Roger Ebert calls the “Unmotivated Close-Up.” The small spaceships start shooting at Kit and the new guy, so they run away and go back to the cave shelter. There Kit reviews the film he took and discovers the new guy is a slave, used by an unknown race to help mine the ore on Mars. Kit immediately acts like a supreme jackass, telling the new guy — who obviously doesn’t even understand him — that “I’m the boss now”. He decides to just give the man the name “Friday”, “with apologies to Robinson Crusoe,” instead of attempting to discern the man’s real name. When he hears Friday speak, he decides he’s going to force Friday to learn English; when they go to the water pool to get water and reeds, Kit sits in his stone chair like it’s a throne and orders Friday to do all the work. Kit’s craptastic behavior becomes almost unbearable when he yells at Friday that he’s “retarded” because he can’t understand English. If you were wondering why Friday looks so familiar, it’s because he’s played by Victor Lundin, who was a Klingon in the first episode of “Star Trek” that ever featured Klingons. Lundin has appeared in many TV shows and films, and he’s even composed music based on “Crusoe” and performs these songs at sci-fi conventions. Kit and Friday go exploring and come across a cave of dead slaves. Kit seems chagrined but doesn’t get a chance to apologize before a meteor hits the atmosphere and rains suffocating ash down on them. Friday saves Kit from smothering under the ash, and now they’re buddies. Friday has wristbands that the unknown alien race can track him down with, resulting in the cave being zapped by the mining ships. With Mona in tow, they climb through some caverns and eventually get Friday’s cuffs off so they can elude the attacking spaceships. They make it to the polar ice caps, their new water source, but it’s so cold they’re all about to freeze to death. Miraculously, a meteor hits nearby and melts the ice, warming the area up. Immediately afterwards a U.S. spaceship zips by, and Kit’s able to contact them via his salvaged radio. Abruptly, the movie is over and everyone is saved. 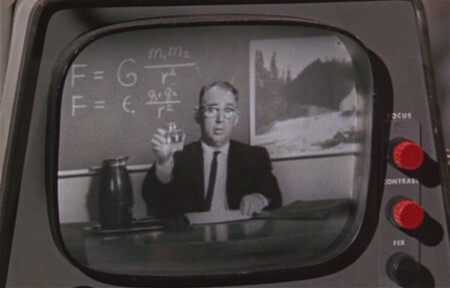 The Criterion Collection DVD comes with a 20 minute featurette called “Destination: Mars”, an interesting but somewhat dry comparison of real scientific knowledge versus the science shown in “Crusoe”. The featurette is marred by the distracting use of the Comic Sans font throughout, but otherwise provides useful information, especially about the original idea of including Martian monsters in the film. 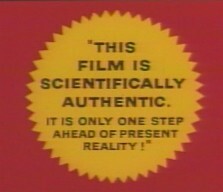 “Crusoe” was advertised as being scientifically accurate, with technology that was just over the horizon. Interestingly, the notion that Mars might have breathable oxygen and some stores of water was dashed just one year after the film was released. The print on the Criterion DVD is simply beautiful. The sound is terrific and mixed well, making the deep silence of isolation more intense, and the lovely serene music more beautiful. This is a lovely film, very intimate and impressive, and suitable for the whole family. More screencaps are posted after the LINKS section below. Stacia, you have really outdone yourself. My brother (12 years my senior) used to regale me with tales of this movie when I was growing up. I wanted desperately to see it as my fevered young brain conjured up images of a Star Wars-type adventure. This was back in the days before VHS had exploded so I was left at the mercy of the T.V. gods for a chance to see it and, as you know they are a fickle bunch. Lo and behold, many years later, when I had nearly forgotten I had ever heard of this movie, it turned up on cable late one night. While it was not quite as awesome as I’d made it out in my head, it was a nice little surprise. I am so glad someone else has heard of this movie! I’m glad you like the post! A few months ago someone on rec.arts.movies.past-films mentioned this film which I’d never heard of before. Out of curiosity I rented it and I was completely charmed.